06:15: it’s time to get up after the first night of good sleep since long. We dress and drive to a nearby Restaurant to have a real American breakfast with ham, eggs and hash browns. With full bellies we start exploring the surroundings of Page. First we hike 3/4 Mile through soft sand to the Horseshoe point, where we see the Colorado deep down in the canyon. 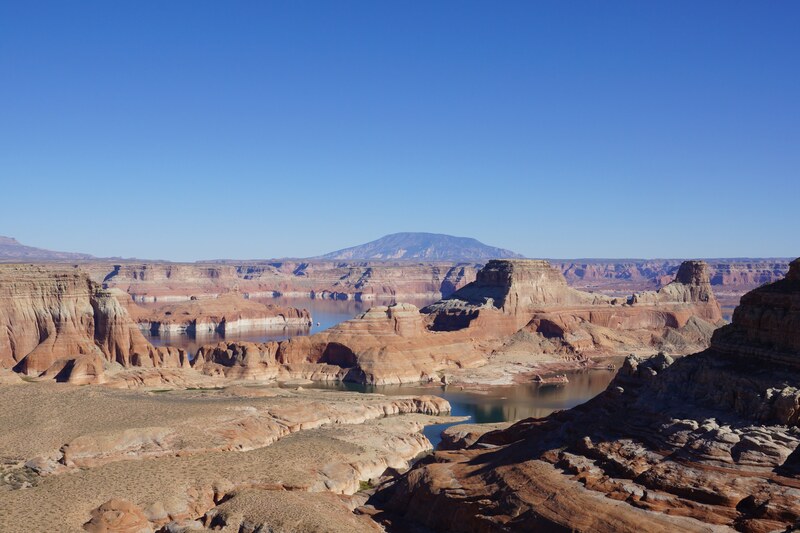 Then we drive to the Antelope Canyon Marina where we decide to take a bath to cool down and wash away the sweat from the strenuous walk earlier this morning. So we just drop our cloth and jump into Lake Powell. Towards noon we visit the lower Antelope Canyon. The sun is standing high in the cloudless sky: ideal conditions to take some (200) spectacular pictures. We decide to spend another night in Page and return to the same Motel we stayed last night. Again, we feel like having Italian food for dinner, but today we go to a different Italian Restaurant. And, as yesterday, watch the sunset over Lake Powell this time without rainbow and pink clouds.